Grieving is a natural process that we each must go through in our lives. There are many reasons to grieve, not just the death of a loved one. 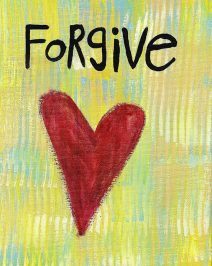 The key is to not get stuck in the grieving process, to allow yourself to grieve and feel all the emotions that go along with it. We all have hopes and dreams for our children. When one of them is diagnosed with a disability, it is important to grieve for those hopes and dreams that may not be possible. We need to come to a place of acceptance. My oldest son Trey was diagnosed with Asperger’s Syndrome at the age of 7. Trey was a wonderful blessing from God from the moment I found out I was pregnant with him. That has never changed. I have never asked God why he gave me a son with Asperger’s. I have never seen him as defective or broken. He doesn’t need to be fixed or cured of anything. He needs acceptance and guidance to be the best person he can be, just like the rest of us. When I explained to Trey that he has Asperger’s, I told him that it didn’t mean there was anything wrong with him, he just see’s things differently than the rest of us. He needed to be taught some things that come naturally to most people. I could see the relief in his eyes and on his face. He knew he was different and now he understand why. Trey has this amazing perspective on things. He is very smart and at times funny. He loves children and is very gentle and loving with them. At times he doesn’t want to be touched or hugged and he just wants to be alone. I usually wait for him to come hug me when he needs it. Trey is now 12 and I wouldn’t change a thing about him, raging pre-teen hormones and all. I am truly blessed to have him in my life. 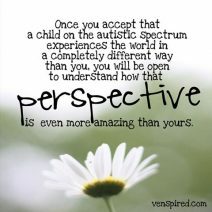 My hope and prayer for all parents with children touched by Autism is that they can see them for the gift they are. Learn from them as you teach them. Don’t be embarrassed by your child. Don’t think of them as defective, broken or damaged. There is no cure and there doesn’t need to be one! Allow your child to be who he is. The Rock—His work is perfect; all His ways are entirely just. Embrace your child as God’s wonderful creation, a gift from your heavenly father to teach and learn from, to love and be loved.